We made our annual trip up to NH to see the Ice Castle this past weekend. I get so excited for this trip every year! P was really little when we went last year, but she was able to understand and enjoy it more this year which was so ridiculously cute. She loves snow, and the little mini ice slides were a hit! Every year when I post our pictures (see 2015-2017 here), I get a few questions about it. So I thought I'd share a few tips if anyone else decides to visit for themselves! I think there may only be a couple weeks left in the season for NH, but you could always plan ahead for next year, too! 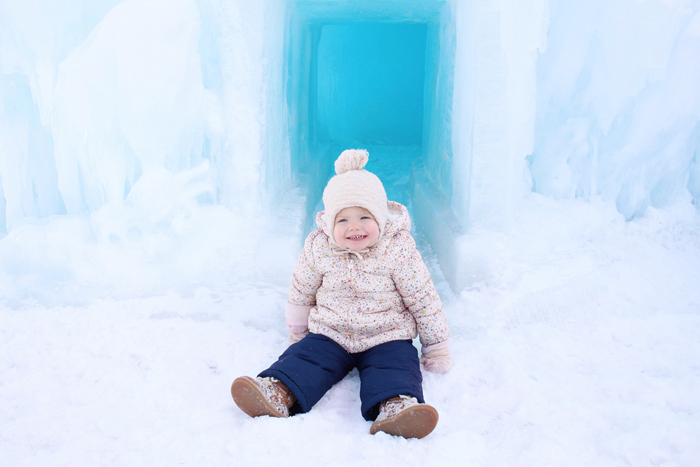 The ice castle we visit is in Lincoln NH, but there are other locations in Utah, Minnesota, Colorado, and Canada (visit there website for info). Our experience is only at the NH location, but I'm sure a lot of my tips apply to the others, as well. Buy your tickets online ahead of time. Standby tickets aren't always available. Try to get your tickets for the earliest timeslot of the day (this year on a Saturday it was 11am). AND get there early. We were 20 min early and lucked out because they opened the gate early. This is how I get most of the good pictures. We try to be some of the first people in there and get most of the picture taking out of the way before the wave of people start pouring in. Wear good boots. The ground is all snow and can be a little difficult to walk on without proper footwear. Dress the kids in full snowsuits/snowpants. And warm gloves. They'll want to crawl through the tunnels and go down the ice slides and sit on the ice throwns! Speaking of kids, don't bring a stroller. You'll never make it on the snowy ground. Bring a sled with a string to pull them around. And wear small babies in carriers. I think they may list appearances on the website, or you may just get lucky and be there when Elsa and Anna and Olaf make a visit! This isn't about the ice castle itself, but every year we head to lunch at Gypsy Cafe after we're done there. It's our favorite spot! Try the grilled cheese fondue and cranberry mac and cheese. P.S - this is not sponsored at all. I just love this place and thought I'd share what I've learned over the years! Now scroll and enjoy some more photos. I think this year's photos may rival 2015 as my favorite set.